Hang out in the yoga world long enough and you’re bound to encounter an accomplished yogi floating through an astonishing array of arm balancing postures. These asanas, which involve pretzel-like contortions performed while balancing on the hands, demand incredible reserves of strength and agility. They also require hefty doses of patience and tenacity, since inevitably the learning process includes one enormous crash after another back down to earth. 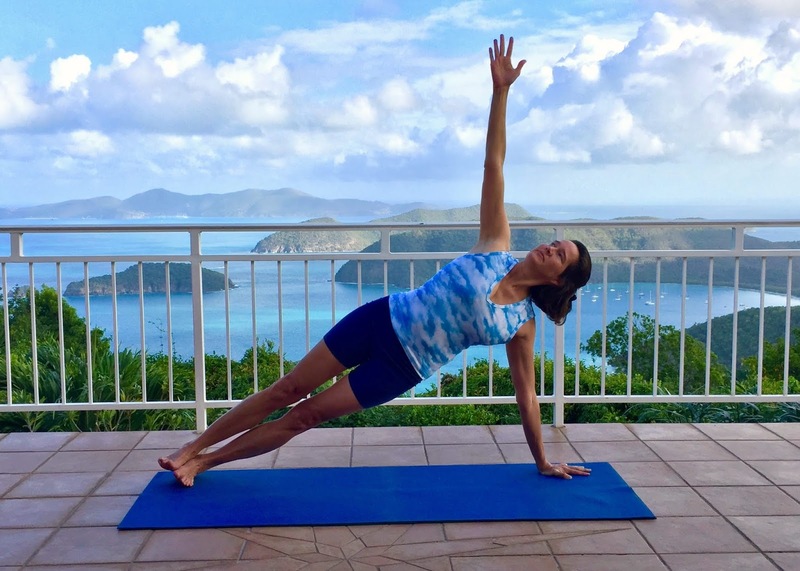 Vasisthasana, or pose dedicated to the sage Vasistha, serves as excellent preparation for more advanced arm balances, as well as other postures that require a strong and steady upper body. This pose strengthens shoulder, arm and abdominal muscles while cultivating a refined sense of balance. Diligent practice of vasisthasana also nurtures stamina, determination and will power - traits that serve us well not only in yoga but in our day-to-day lives as well. I must admit, I rarely hear fellow yogis wax poetically about vasisthasana. Mention of the pose, in fact, tends to elicit groans of displeasure and even dread. This asana is a steely one after all, and it demands both perseverance and elbow grease. Despite being categorized by some as a "baby balance," there’s nothing easy about this pose. But like brussels sprouts and brewer’s yeast, vasisthasana is good growing food. As such, it poses an important question: How can we muster up the energy and spirit to embrace even life’s challenges with enthusiasm? Or at the very least, how can we manage the impossible with some measure of gusto and grace? It’s easy to trudge through a demanding pose, a Monday morning, or even a lifetime without passion or fervor. But the spiritual journey teaches us to move beyond liking or disliking the moment before us, and instead invites us to cultivate steadfast engagement, curiosity and even delight in the play of all life as it passes through us. In my experience, vasisthasana can be less intimidating when we forget altogether that we’re encountering a demanding pose, and instead consider it just another an opportunity to challenge ourselves in new and interesting ways. In fact, when I introduce vasisthasana to my students I don’t even hint that we’re moving toward a real yoga pose. I simply slip a modification into our yoga flow with little fanfare or flourish. You, too, can sneak an introduction to vasisthasana into your practice without much ado. Here’s how: After warming up by rising into downward-facing dog pose a few times, let your form-fitted dog loosen up a little bit. Consider the possibility of moving into a three-legged dog, picking up one leg and reaching it skyward for just a breath or two before returning to your more conventional, four-legged version of the pose. Try the same exploration on the second side before settling into child’s pose for a few quiet and easy breaths. When you feel calm and rested, return to downward-facing dog. Now repeat the three-legged variation, but this time lift a hand off the ground instead of a foot. Shift your weight to your right, pick up your left hand and reach it upward. To deepen the action, rise onto your toes and pivot toward the left, and then spin your hips, belly and face in that direction as well. Don’t worry here about grace or coordination. This is only a bare approximation of the pose, and we’re merely trying to accustom ourselves to the slightly precarious balancing act that vasisthasana requires. Have a little fun with this, and give yourself permission to enjoy the opportunity to stretch your body in new and unusual ways. Return to downward dog and try the same variation to the right. As you grow more comfortable with this exploration, you might try releasing your hips a few inches forward toward your hands to help your body inch its way closer to the classic pose. A few three-legged dogs may be enough the first few times you try them, since it’s always a good idea to avoid straining your wrists and shoulders. Child’s pose can offer a soothing break for the upper body, especially if you settle your hands onto the floor by your feet, palms up and fingers pointing behind you. When you’re ready to move into a more traditional, form-fitted vasisthasana - either today or some day in the future - return to downward facing dog pose. Let’s turn to the left first, balancing on your right foot and hand. Pick up your right foot, turn the right leg inward so your toes point to the left, and then place the outer edge the foot onto the ground in line with the right hand. Flex the foot so the sole runs parallel to the end of your sticky mat. Stay firm through the inner heels, avoiding the tendency to sickle the foot by sinking the outer ankle toward the ground. When you feel relatively stable here, take a few easy breaths and commit yourself to enthusiasm and good spirit, regardless of whether your next move sends you balancing gracefully in the air or spiraling back to earth with an enormous and un-yogic thud. Shift your weight toward your right hand and foot, rise up onto your left fingertips, and place your left leg atop the right, with the inner knees, heels and arches of the feet touching. And then in one symphonic action, spin your pelvis, heart and nose to the left, slip your hips toward your right hand, and reach your left arm toward the sky. Don’t be surprised if the first few times you try this, you waffle and waver and swerve and sway. If this happens, resist the tendency to beat yourself up. Instead use this as an opportunity to cultivate a sense of humor. This is a hard pose, after all, and it’s worth remembering that your life doesn’t depend on your ability to master vasisthasana. Think like a kid on a playground and enjoy the raw sensations of the body teetering and tottering in space during this precarious balancing act. If you manage to stay aloft in the pose, after a few breaths reverse your actions to move back into downward dog pose. Pause here to re-establish your composure, and then repeat this action on the second side. (Alternatively, insert an easy child’s pose in between sides to give your body a little break). This time imagine you’re practicing vasisthasana while perched upon a balance beam. Arrange your pelvis, chest and uplifted arm so they hover in a single plane directly above your imaginary beam. At the same time, drop your pelvis so that the left and right sides of the waist are equally long and a line traced through the center of your body - from inner arches through pelvis, spine, neck and head -would be lean and straight rather than curved like a banana. Your supportive arm should be either directly beneath your shoulders or a little farther forward beneath your ear. Now hug your muscles determinedly inward, cultivating strong and lava-like warmth in the marrow of your bones. Arrange your spine in neutral alignment - just as when you’re standing in mountain pose - with the shoulder blades nestling in toward the heart and the lower back long and uncompressed. Imagine each vertebra is a magnet gently attracting all the bits and pieces of your outer body toward your core. All this inward concentration of energy can create an invigorating sense of heat and power within. We want to avoid overcooking ourselves, though, so let’s balance this inward centering with enthusiastic extension outward. Instead of sinking heavily into the supporting shoulder and arm, root that hand firmly into the earth and let the earth’s energy rebound back up through you to create a sense of lightness in the elbows, shoulders and chest. Reach the fingers of the upper hand whole-heartedly toward the sky. Soften the eyes, unfurrow your brow, and breathe steadily. Extend through the crown of your head as you press the heels firmly in the opposite direction. In your mind’s eye create long and even lines connecting the soles of your feet to the crown of your head, and from the left hand all the way out through the right. You might even imagine those lines extending well beyond you to the far ends of the universe. Let the inward and outward expressions of life play together as you breathe mindfully and rhythmically in the pose. When you inhale, draw your energy inward with determination and presence, stoking the inner flames of your life. When you exhale, extend your sense of self outward into the world with confidence and gusto. Balance here for a few more breaths, enjoying the steady vigor that builds as you alternate between these inward and outward currents of energy. Enjoy the challenge of vasisthasana, along with the power and vitality it cultivates. Invite your body to be both strong and light. Slip a little helium into your joints to inject a measure of spaciousness and levity into the heat of the moment. And by all means, when you waffle, when you waver, when you fall to the floor with a chandelier-rattling crash, don’t forget to laugh.